The QCTV staff members are creative, curious, and collaborative team members producing award-winning programs for the member cities of Andover, Anoka, Champlin, and Ramsey. QCTV is proud of the Alliance for Community Media NATIONAL HOMETOWN award for Overall Excellence 2015. Jared Boyer is an Anoka High School graduate, who went on to earn a Bachelor of Arts Degree in communication from UMD. With his love of all things sports, Jared also earned a minor in coaching. In addition to enjoying baseball and basketball, Jared also likes watching hockey, March Madness, and the Olympics. When he isn’t working, Jared enjoys fishing, hunting, watching movies and spending time with his large family. One day Jared hopes to be filming for the Winter X-games and Olympics. Karen George is a communications professional with thirty years’ experience in California and Minnesota ranging from television reporter, communications director for city government, communications and marketing professional for a school district, and currently as an executive director. 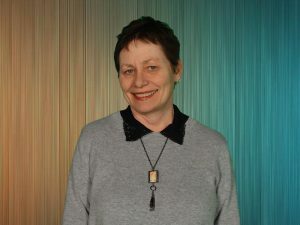 In Karen’s current leadership role at Quad Cities Cable Communications Commission and QCTV, she is responsible for representing the cities of Andover, Anoka, Champlin, and Ramsey in telecommunications policy and regulation, overseeing the programming of seven local cable channels, and managing a video production facility. She holds a B.A. degree in communications from Concordia College, Moorhead, a Masters of Business Communications graduate certificate from the University of St. Thomas, and a Minnesota Community Education Director license. 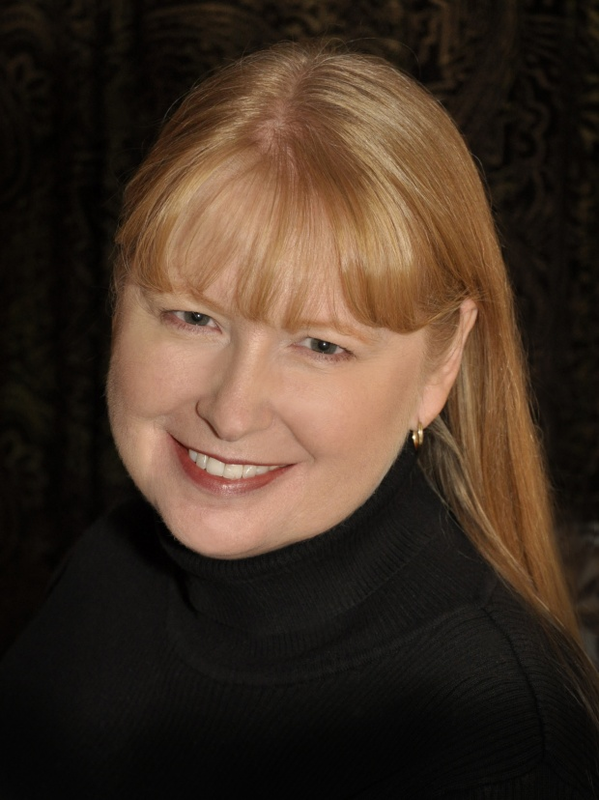 Karen has held various leadership positions with professional associations and her work has been recognized with numerous state and national awards including the prestigious Paul B. Clark Award for leadership from CAPIO and both Bronze Quill and Silver Quill awards from IABC. She is a past president of the Minnesota School Public Relations Association (MinnSPRA), the California Association of Public Information Officials (CAPIO), and has been active in state and regional activities of the International Association of Business Communicators (IABC). Karen serves in leadership roles on various non-profit organizations and enjoys community volunteering; reading and listening to books; live music, especially blues and folk; staying active with downhill skiing in the winter and biking in the summer; traveling to interesting places or just relaxing at the family cabin; creating keepsakes with needlepoint and sewing; trying new recipes and restaurants, and of course experiencing many new adventures with friends. 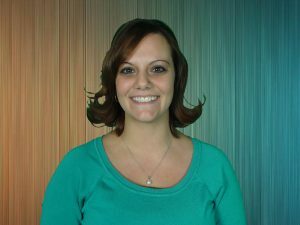 Taylor Johnson holds a Bachelor of Arts degree in Media Communications from Bethel University. His background includes working at KSTP-TV serving as production assistant and master control operator, he also served as studio operator for Twin Cities Live, various newscasts and was also responsible for program scheduling. Taylor also worked for CTV in Roseville as the mobile truck technician/producer supervising production crews, directing live productions as well as installing and troubleshooting equipment. He has produced countless sporting events throughout the state of Minnesota and is experienced in working with the Minnesota State High School League, with various school athletic directors, and team booster clubs. In Taylor’s spare time he enjoys fishing, boating, swimming, hunting, camping, going on road trips…basically anything outdoors! You can see his work on QCTV’s productions including The Sheriff Show, parades, graduations, and various sporting events. Winter Kucharski is a graduate of the University of Minnesota with a double major in Communication Studies and Theatre Arts. 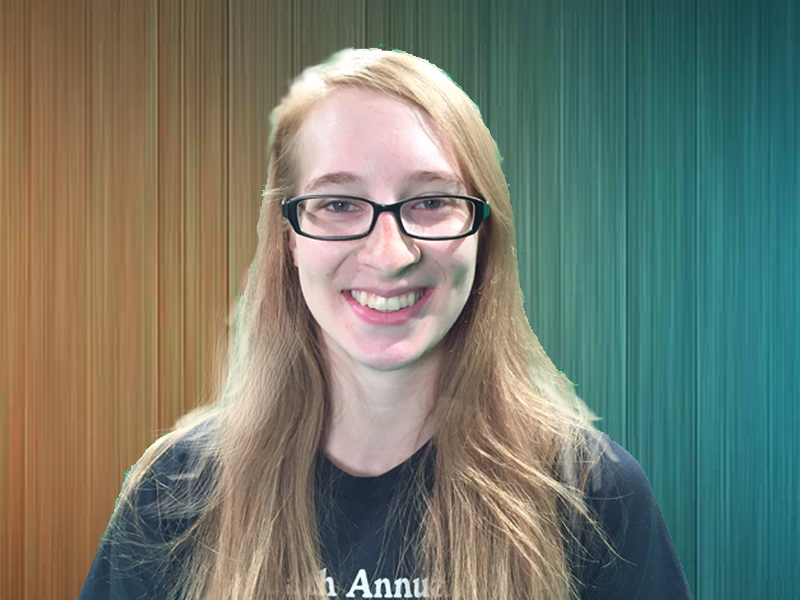 She has been at QCTV as a production assistant since October of 2014 and has worked on many mobile production shoots. She has also provided on-camera talent for PSA’s and hosted several live productions for QCTV. In her spare time, Winter enjoys sewing dresses for herself and hammocks for her pet rats. When not wandering amongst the trees of a forest, Winter can be found exploring the fantastical worlds of the latest video game; she hosts Live Trivia games in the community. Katherine Lenaburg holds a Bachelor of Arts degree in Speech Communications from the University of Minnesota as well as a graduate of Broadcasting from Brown Institute. She has over 35 years of experience as a television and radio reporter, anchor, news director, program manager, and she is also the owner of Kat Woman Productions, which is a full service video production company. Katherine served on the start-up team for Continental Cablevision’s local origination business, produced award-winning programs, and was active with Metro Channel 6 as a board member. In her spare time Katherine enjoys art, music, reading, movies, gardening and traveling. Cory Laing holds an Associate of Applied Science degree in digital video from Hennepin Technical College. 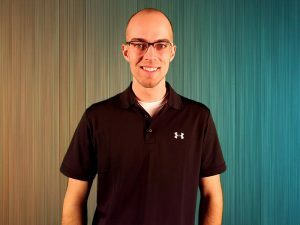 Cory has produced government and community based content for the cities of Andover, Anoka, Champlin and Ramsey. He has worked with city staff to produce information and promotional videos for many events. 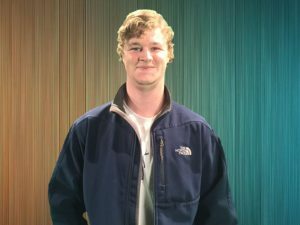 Cory brings to QCTV a knowledge of operations, encompassing studio and field production and city meeting coverage. In his spare time Cory enjoys all things pop culture, television production, being a dog owner, and summer grilling. You can see his work on QCTV’s production News and Views. Lisa Monserud holds an Associate of Applied Science degree in Business Administration from the Minnesota School of Business. She brings a background in business, marketing, and computer technology to QCTV. Her hobbies include watching her boys race (Superstock and Go-Kart), spending time with her family, traveling and cuddling with her two mini dachshunds. You can see her creative graphics work on QCTV’s web site as well as many bulletins showcasing community events. Ravi Butler holds a Bachelor’s Degree in Communication Media & Rhetoric from University of Minnesota- Morris. His background in Television includes numerous positions working for KSTP-TV as a Studio Production Assistant, Video Intern for the Minnesota Vikings, Video Tower Operator for Canterbury Park, Television Production Assistant for CTN-Studios, Park TV, and Eagan TV. 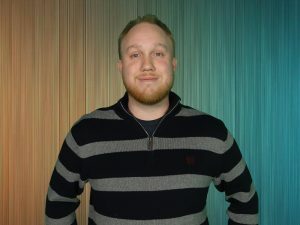 He is also a freelance videographer for companies like Mars Reel, Drama Kids International, Triple Threat Productions Inc., and Kick Harder Productions. In his free time, he likes to play video games and soccer, and watch action and comedy movies. 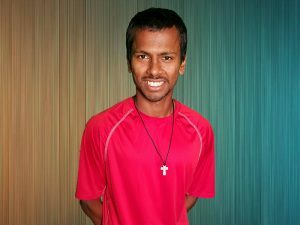 He has also been to numerous countries such India, England, Cambodia, and Portugal. One of his goals is to direct a World Cup or Manchester United professional soccer game on television. Jim brings to this position many years of community television experience ranging from mobile production, editing, and channel scheduling. He has spent the past several years here at QCTV. Jim schedules six channels as well as ensuring that the video content is correctly formatted and loaded onto the servers for non-channel distribution. Additionally, Jim completes city hall equipment checks in the member cities of Andover, Anoka, Champlin, and Ramsey. 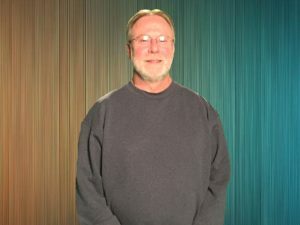 Jim also is available to assist with our studio during our live shoots and other productions. 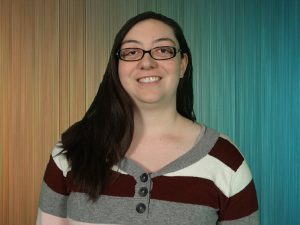 Leslie Sauer holds a Bachelor of Arts degree from the University of Wisconsin – River Falls, she majored in communications with an emphasis in digital film and television and also minored in art. She did her internship at WCCO-TV where she worked on various documentaries as well as for KSTP-TV for a little over three years. Leslie has also freelanced on the side working on TLC’s Randy to the Rescue. In her spare time she enjoys movies, music, photography, drawing and painting. Leslie also enjoys going camping and traveling. You can see her work on QCTV’s productions including The Local Show, District Court Show, and League of Women Voters shows. John first got involved in community media while attending the University of Minnesota – Twin Cities campus. Radio K, the student run radio station, had just started and he became a DJ there. Soon he was involved as a live sound engineer for their weekly live music show, Off the Record. 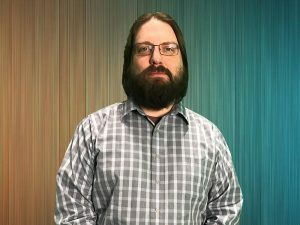 John worked for the Minnetonka School district after college and helped start the video program at the high school, editing his first project with Final Cut Pro 1.25 on a G4. He then spent 11 years and went through three different job titles at CTV North Suburbs in Roseville, MN. After work, John enjoys reading paper versions of eBooks on various odd subjects. John co-owned an analog recording studio in the late ‘90s and still likes to talk about microphones. He currently co-owns a small pro audio manufacturing company in Minneapolis. 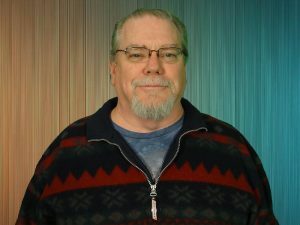 Dave has worked in broadcasting on a full and part time basis for over twenty years, most recently as a part-time production assistant at QCTV. Some of his jobs along the way have included nearly 15 years as a volunteer and part time employee with North Metro Channel 15, and 12 years as sports announcer and writer with Minnesota Score. Dave currently works as the producer/engineer with the Johnnies Football Radio Network, and will begin his 10th season this fall. Dave holds a broadcast degree from Brown College and is currently completing his AA degree at Hennepin Technical College. Dave will continue his work on mobile production shoots and will begin delivering quality coverage of government meetings. He will also collaborate on staff productions such as The Grid, Live and Local, and the Local Show. Andrew Zachariason graduated from St. Cloud State in 2015 with a major in film studies and a minor in mass communication. In his time there he made short films and produced UTVS’ news show on Mondays. 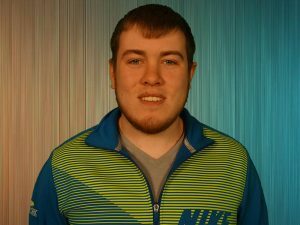 Andrew has a passion for both film and sports, which led him to QCTV after he graduated. He also works as a production assistant in the Minnesota film industry. One day he hopes to be a film director, and until then he is learning as much as possible about production. In his free time he can be found watching movies, writing about movies, or thinking about movies.